Our usual Saturday walk down Walthamstow Market seemed to take forever this week with all the disruption from Thames Water digging up the road. But there were lots of bargains on offer, strawberries are flooding in at 2 or 3 punnets for a pound, the boxes of honey mangos are arriving – £5 at the moment, and big bags of oranges were only £2 – cheaper than cartons of juice from the supermarkets. But we were after tomatoes – and we got 4 punnets of ripe cherry tomatoes for £1 – you won’t find a deal like that in Sainsburys! 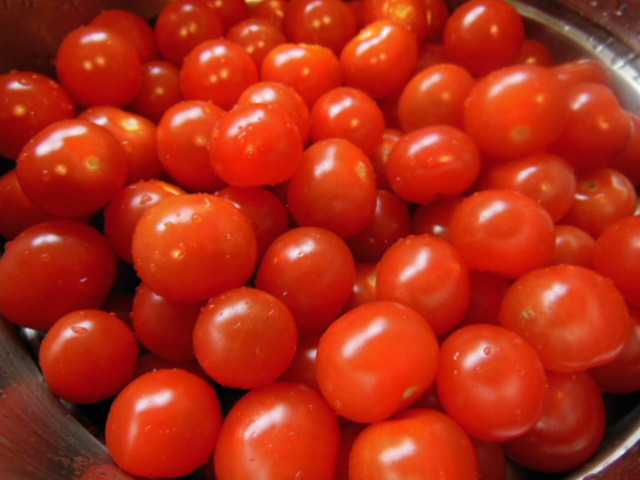 I wanted to make sunblush tomatoes – the delectable Italian semi-dried tomatoes. This is such a simple recipe that I’m almost embarrassed to share it, except that they are so tasty and versatile that it would be a shame if you didn’t try them. Great added to rissotto, pasta sauces, salads and soups. Preheat the oven to it’s lowest temperature setting. 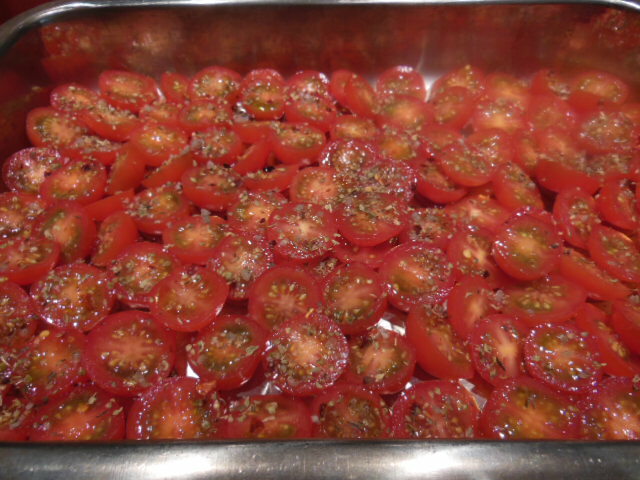 Remove the stems from the tomatoes and cut them in half along across the middle. Place cut side up in a single layer on a baking tray. Sprinkle with the salt, oregano and sugar. Drizzle over the olive oil and pop them into the oven. Cook for 3 hours, until the tomatoes are soft and fragrant. Once they’ve cooled, store in a jar in the fridge covered in olive oil. They will stay fresh for at least 2 weeks, but they taste so good they may not last that long! 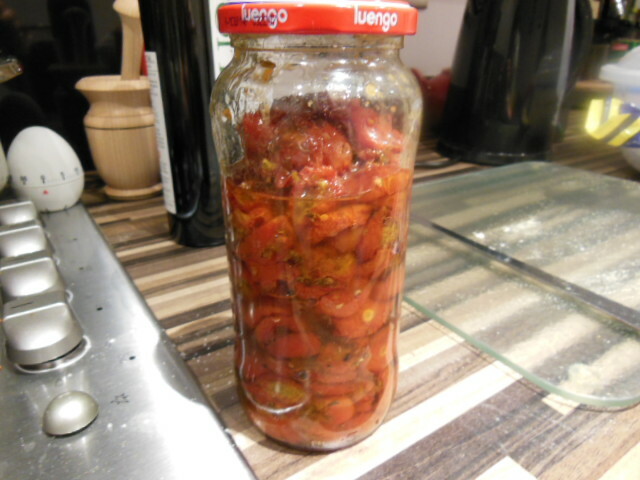 This entry was posted in Recipes and tagged cheap, Olive oil, sunblush, Tomato, tomatoes, Walthamstow Market. Bookmark the permalink. How long do you have to cook them for and at what temperature? HI about three hours on your lowest oven temperature – enjoy! Just trying a batch now can’t wait… My poor daughter doesn’t know it yet but she’s going to be chief taster !!! Hope it goes well – enjoy!